Ride, si sapis. It is precisely because it is our desire that the “misgivings” awakened should reach those in whom the sense of personality and conceit has not yet entirely stifled their better feelings, and force them to recognize themselves in the mirror offered to them in the “Talking Image,” that we publish the “satirical” novel. The editor of LUCIFER has done a bold thing. She is publishing a story called “The Talking Image of Urur,” which is designed to satirise the false prophets of Theosophy in order that the true prophets may be justified. I appreciate the motive entirely, but, unfortunately, there are weak-minded theosophists who can see nothing in Dr. Hartmann’s spirited talk but a caricature of their whole belief. 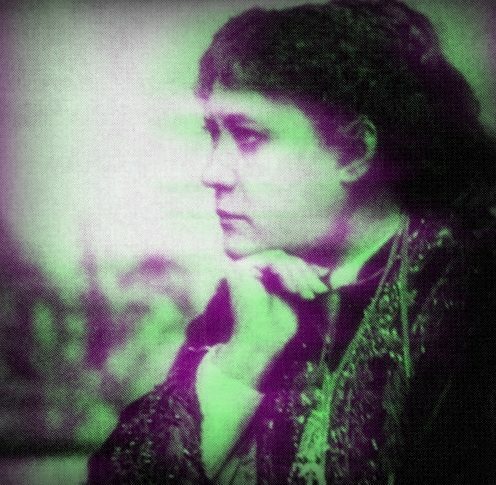 So they have remonstrated with Madame Blavatsky, and she replies in LUCIFER that “the story casts more just ridicule upon the enemies and detractors of the Theosophic Society than upon the few theosophists whose enthusiasm may have carried them into extremes.” Unfortunately, this is not strictly accurate. The hero of the tale, a certain Pancho, is one of these enthusiasts, and it is upon him and upon the mock “adepts” who deceive him that the ridicule is thrown. But it never seems to have occurred to Madame Blavatsky and Dr. Hartmann that the moment you begin to ridicule one element, even though it be a false element, in the faith, you are apt to shake the confidence of many if not most believers, for the simple reason that they have no sense of humour. The high priestess of the cult may have this sense for obvious reasons,1 but her disciples are likely to be lost if they begin to laugh, and if they can’t laugh they will be bewildered and indignant. I offer this explanation with all humility to Madame Blavatsky, who has had some experience of the effects of satire. The more so as, according to those members of the T.S. who have read the whole story, it is precisely “Madame Blavatsky” against whom its satire is the most directed. And if “Mme. Blavatsky” – presumably “the Talking Image” – does not object to finding herself represented as a kind of mediumistic poll parrot, why should other “theosophists” object? A theosophist above all men ought ever to bear in mind the advice of Epictetus: “If evil be said of thee, and if it be true, correct thyself; if it be a lie, laugh at it.” We welcome a witty satire always, and defy ridicule or any efforts in this direction to kill the Theosophical Society, so long as it, as a body, remains true to its original principles. As to the other dangers so kindly urged by the Post, the “high priestess” acknowledges the benevolent objections by answering and giving her reasons, which are these: The chosen motto of the Theosophical Society has been for years – “There is no religion higher than truth”; the object of LUCIFER is in the epigraph on its cover, which is “to bring to light the hidden things of darkness.” If the editor of LUCIFER and the Theosophists would not belie these two propositions and be true to their colours, they have to deal with perfect impartiality, sparing no more themselves than outsiders, or even their enemies. As to the “weak-minded theosophists” – if any – they can take care of themselves in the way they please. If the “false prophets of Theosophy” are to be left untouched, the true prophets will be very soon – as they have already been – confused with the false. It is nigh time to winnow our corn and cast away the chaff. The T.S. is becoming enormous in its numbers, and if the false prophets, the pretenders (e.g., the “H.B. of L.,” exposed in Yorkshire by Theosophists two years ago, and the “G.N.K.R.” just exposed in America), or even the weak-minded dupes, are left alone, then the Society threatens to become very soon a fanatical body split into three hundred sects – like Protestantism – each hating the other, and all bent on destroying the truth by monstrous exaggerations and idiotic schemes and shams. We do not believe in allowing the presence of sham elements in Theosophy, because of the fear, forsooth, that if even “a false element in the faith” is ridiculed, the latter “is apt to shake the confidence” in the whole. At this rate Christianity would be the first to die out centuries ago under the sledge-hammer blows dealt to its various churches by its many reformers. No philosopher, no mystic or student of symbolism, can ever laugh at or disbelieve in the sublime allegory and conception of the “Second Advent” – whether in the person of Christ, Krishna, Sosiosh, or Buddha. The Kalki Avatar, or last (not “second”) Advent, to wit, the appearance of the “Saviour of Humanity” or the “Faithful” light of Truth, on the White Horse of Death – death to falsehood, illusion, and idol, or self-worship – is a universal belief. Shall we for all that abstain from denouncing the behaviour of certain “Second Adventists” (as in America)? What true Christians shall see their co-religionists making fools of themselves, or disgracing their faith, and still abstain from rebuking them publicly as privately, for fear lest this false element should throw out of Christianity the rest of the believers? Can any of them praise his co-religionists for climbing periodically, in a state of paradisiacal decolleté, on the top of their houses, trees, and high places, there to await the “advent”? No doubt those who hope by stealing a march on their slower Brethren to find themselves hooked up the first, and carried bodily into Heaven, are as good Christians as any. Should they not be rebuked for their folly all the same? Strange logic! That such, however, is the policy of no other paper we know a daily, a weekly, a monthly, or a quarterly – we are quite aware. But, then, they are the public organs of the masses. Each has to pander to this or that other faction of politics or Society, and is doomed “to howl with the wolves,” whether it likes or not. But our organs – LUCIFER pre-eminently – are, or ought to be, the phonographs, so to speak, of the Theosophical Society, a body which is placed outside and beyond all centres of forced policy. We are painfully conscious that “he who tells the truth is turned out of nine cities”; that truth is unpalatable to most men; and that – since men must learn to love the truth before they thoroughly believe it – the truths we utter in our magazine are often as bitter as gall to many. This cannot be helped. Were we to adopt any other kind of policy, not only LUCIFER – a very humble organ of Theosophy – but the Theosophical Society itself, would soon lose all its raison d’être and become an anomaly. But “who shall sit in the seat of the scorner?” Is it the timid in heart, who tremble at every opinion too boldly expressed in LUCIFER lest it should displease this faction of readers or give offense to that other class of subscribers? Is it the “self-admirers,” who resent every remark, however kindly expressed, if it happens to clash with their notions, or fails to show respect to their hobbies? Surely we learn better and profit more by criticism than by flattery, and we amend our ways more through the abuse of our enemies than the blind pandering of friends. Such satires as the “Fallen Idol,” and such chelas as Nebelsen, have done more good to our Society, and certain of its members, than any “theosophical” novel; for they have shown up and touched au vif the foolish exaggerations of more than one enthusiast. Self abnegation is possible only to those who have learnt to know themselves; to such as will never mistake the echo of their own inner voice – that of selfish desire or passion – for the voice of divine inspiration or an appeal from their MASTER. Nor is chelaship consonant with mediumistic sensitiveness and its hallucinations; and therefore all the sensitives who have hitherto forced themselves into discipleship have generally made fools of themselves, and? sooner or later, thrown ridicule upon the T.S. But after the publication of the “Fallen Idol” more than one such exhibition was stopped. “The Talking Image of Urur” may then render the same, if not better, service. If some traits in its various dramatis personæ fit in some particulars certain members who still belong to the Society, other characters – and the most successful of them – resemble rather certain EX-members; fanatics, in the past, bitter enemies now – conceited fools at all times. Furthermore “Puffer” is a compound and very vivid photograph. It may be that of several members of the T.S., but it looks also like a deluded victim of other bogus Esoteric and Occult Societies. One of such just sprung up at Boston U.S.A., is now being nipped in the bud and exposed by our own Theosophists. These are the heroes whom certain timid Theosophists – those who raised their voices against the publication of the “Talking Image of Urur – “advised us to leave alone. Had it not been for that unwillingness to expose even impersonal things and deeds, our editorial would have been more explicit. Far from us be the desire to “attack” or “expose” even our enemies, so long as they harm only ourselves, personally and individually. But here the whole of the Theosophical body – already so maligned, opposed, and persecuted – was endangered, and its destinies were hanging in the balance, because of that impudent pseudo esoteric speculation. He, therefore, who maintains in the face of the Boston scandal, that we did not act rightly in tearing off the sanctimonious mask of Pecksniffian piety and the “Wisdom of the Ages” which covered the grimacing face of a most bestial immorality, of insatiable greediness for lucre and impudence, fire, water, and police proof – is no true Theosophist. How minds, even of an average intelligence, could be caught by such transparent snares as these publicly exhibited by the two worthies, to wit: Adhy-Apaka and Vidya Nyaika – traced by the American press to one Hiram E. Butler and Eli Ohmart – passes all comprehension! Suffice to read the pamphlet issued by the two confederates, to see at the first glance that it was a mere repetition – more enlarged and barefaced, and with a wider, bolder programme, still a repetition – of the now defunct “H.B. of L.” with its mysterious appeals of four years ago to the “Dissatisfied” with “the Theosophical Mahatmas.” The two hundred pages of the wildest balderdash constitute their “Appeal from the Unseen and the Unknown” and the “Interior of the Inmost” (?) to “the Awakened.” Pantognomos and Ekphoron offer to teach the unwary “the laws of ENS, MOVENS, and OM,” and appeal for money. Vidya Nyaika and Ethnomedon propose to initiate the ignorant into the “a priori Sambudhistic (?) philosophy of Kapila” and – beg for hard cash. The story is so sickening that we dislike to stain our pages with its details. But now to the moral of the fable. For fourteen years our Theosophical Society has been before the public. Born with the three-fold object of infusing a little more mutual brotherly feeling in mankind; of investigating the mysteries of nature from the Spiritual and Psychic aspect; and, of doing a tardy justice to the civilizations and Wisdom of Eastern pre-Christian nations and literature, if it did not do all the good that a richer Society might, it certainly did no harm. It appealed only to those who found no help for their perplexities anywhere else. To those lost in the psychic riddles of Spiritualism, or such, again, as, unable to stand the morbid atmosphere of modern unbelief, and seeking light in vain from the unfathomable mysteries taught by the theology of the thousand and one Christian sects, had given up all hope of solving any of the problems of life. There was no entrance fee during the first two years of the Society’s existence; afterwards, when the correspondence and postage alone demanded hundreds of pounds a year, new members had to pay £I for their diploma. Unless one wanted to support the movement, one could remain a Fellow all his life without being asked for a penny, and two-thirds of our members have never put their hand in their pocket, nor were they asked to do so. Those who supported the cause were from the first a few devoted Theosophists who laboured without conditions or any hope for reward. Yet no association was more insulted and laughed at than was the Theosophical Society. No members of any body were spoken of in more contemptuous terms than the Fellows of the T.S. from the first. The Society was born in America, and therefore it was regarded in England with disfavour and suspicion. We were considered as fools and knaves, victims and frauds before the benevolent interference of the Psychic Research Society, which tried to build its reputation on the downfall of Theosophy and Spiritualism, but really harmed neither. Nevertheless, when our enemies got the upper hand, and by dint of slander and inventions had most maliciously succeeded in placing before the credulous public, ever hungry for scandals and sensations, mere conjectures as undeniable and proven facts, it was the American press which became the most bitter in its denunciations of Theosophy, and the American public the most willing to drink in and giggle over the undeserved calumnies upon the Founders of the T.S. Yet it is they who were the first told, through our Society, of the actual existence of Eastern Adepts in Occult Sciences. But both the English and the Americans spurned and scoffed at the very idea, while even the Spiritualists and Mystics, who ought to have known better, would, with a few exceptions, have nothing to do with heathen Masters of Wisdom. The latter were, they maintained, “invented by the Theosophists”: it was all “moonshine.” For these “Masters,” whom no member was ever asked to accept, unless he liked to do so himself, on whose behalf no supernatural claim was ever made, unless, perhaps, in the too ardent imagination of enthusiasts; these Masters who gave to, and often helped with money, poor Theosophists, but never asked anything of the rich – these MASTERS were too much like real men. They neither claimed to be gods nor spirits, nor did they pander to people’s gush and sentimental creeds. And now those Americans have got at last what their hearts yearned for: a bona fide ideal of an adept and magician. A creature several thousand years old. A true-blue “Buddhist-Brahmin” who appeals to Jehovah, or Jahveh, speaks of Christ and the Messianic cycle, and blesses them with an AMEN and an “OM MANE PADMI HUM” in the same breath, relieving them at the same time of 40,000 dollars before they are a month old in their worship of him . . . Wullahy! Allah is great and – “Vidya Nyaika” is his only prophet. Indeed we feel little pity for the victims. What is the psychology that some Theosophists are accused of exercising over their victims in comparison with this? And this necessitates a few words of explanation. All know that there is a tacit, often openly-expressed, belief among a few of the Fellows of the T.S. that a certain prominent Theosophist among the leaders of the Society psychologizes all those who happen to come within the area of that individual’s influence. Dozens, nay, hundreds, were, and still are, “psychologized.” The hypnotic effect seems so strong as to virtually transform all such “unfortunates” into irresponsible nincompoops, mere cyphers and tools of that theosophical Circe. This idiotic belief was originally started by some “wise men” of the West. Unwilling to admit that the said person had either any knowledge or powers, bent on discrediting their victim, and yet unable to explain certain abnormal occurrences, they hit upon this happy and logical loop-hole to get out of their difficulties. The theory found a grateful and fruitful soil. Henceforth, whenever any Fellows connected theosophically with the said “psychologizer” happen to disagree in their views upon questions, metaphysical or even purely administrative, with some other member – “on despotism bent,” forthwith the latter comes out with the favourite solution: “Oh, they are psychologized!” The magic WORD springs out on the arena of discussion like a Jack-in-a-box, and forthwith the attitude of the “rebels” is explained and plausibly accounted for. Of course the alleged “psychology” has really no existence outside the imagination of those who are too vain to allow any opposition to their all-wise and autocratic decrees on any other ground than phenomenal – nay, magical – interference with their will. A short analysis of the Karmic effects that would be produced by the exercise of such powers may prove interesting to theosophists. Even on the terrestrial, purely physical plane, moral irresponsibility ensures impunity. Parents are answerable for their children, tutors and guardians for their pupils and wards, and even the Supreme Courts have admitted extenuating circumstances for criminals who are proved to have been led to crime by a will or influences stronger than their own. How much more forcibly this law of simple retributive justice must act on the psychic plane; and what, therefore, may be the responsibility incurred by using such psychological powers, in the face of Karma and its punitive laws, may be easily inferred. Is it not evident that, if even human justice recognizes the impossibility of punishing an irrational idiot, a child, a minor, etc., taking into account even hereditary causes and bad family influences – that the divine Law of Retribution, which we call KARMA, must visit with hundredfold severity one who deprives reasonable, thinking men of their free will and powers of ratiocination? from the occult standpoint, the charge is simply one of black magic, of envoûtement. Alone a Dugpa, with “Avitchi” yawning at the further end of his life cycle, could risk such a thing. Have those so prompt to hurl the charge at the head of persons in their way, ever understood the whole terrible meaning implied in the accusation? We doubt it. No occultist, no intelligent student of the mysterious laws of the “night side of Nature,” no one who knows anything of Karma, would ever suggest such an explanation. What adept or even a moderately-informed chela would ever risk an endless future by interfering with, and therefore taking upon himself, the Karmic debit of all those whom he would so psychologize as to make of them merely the tools of his own sweet will! There is no sequestered spot in the Universe, no dark niche along the disc of non-existence, from which he (man) can retreat from his relations to others, where he can withdraw the influence of his existence upon the moral destiny of the world; everywhere his presence or absence will be felt – everywhere he will have companions who will be better or worse for his influence. It is an old saying, and one of fearful and fathoming import, that we are forming characters for eternity. Forming characters! Whose? Our own or others’? Both – and in that momentous fact lies the peril and responsibility of our existence. Who is sufficient for the thought? Thousands of my fellow-beings will yearly enter eternity2 with characters differing from those they would have carried thither had I never lived. The sunlight of that world will reveal my finger-marks in their primary formations, and in their successive strata of thought and life. Verily the man or woman in the unconscious possession of such dangerous powers had much better never be born. The Occultist who exercises them consciously will be caught up by the whirlwind of successive rebirths, without even an hour of rest. Woe to him, then, in that ceaseless, dreary series of terrestrial Avitchis; in that interminable a on of torture, suffering, and despair, during which, like the squirrel doomed to turn the wheel at every motion, he will launch from one life of misery into another, only to awake each time with a fresh burden of other people’s Karma, which he will have drawn upon himself! Is it not enough, indeed, to be regarded as “frauds, cranks, and infidels,” by the outsiders, without being identified with wizards and witches by our own members! A “Christian” of such a kind may – as the late Laurence Oliphant has – give vent to a still more startling theory. He may affirm that he considers that “from time to time the Divine Influence emanates itself, so to speak, in phenomenal persons. Sakyamouni was such; Christ was such; and such I consider Mr. (Lake) Harris to be – in fact, he is a new avatar,”4 and still remain a Christian of an “exalted kind” in the sight of the “Upper Ten.” But let an “infidel” of the Theosophical Society say just the same (minus the absurdity of including the American Lake Harris in the list of the Avatars), and no contumely heaped upon him by clergy and servile newspapers will ever be found too strong!
. . . “We are not as optimistic as he (the Abbé Roca) is. His church sees in vain her greatest ‘mysteries’ unmasked and the fact proclaimed in every country by scholars versed in Orientalism and Symbology as by Theosophists; and we refuse to believe that she will ever accept our truths or confess her errors. And as, on the other hand, no true theosophist will accept any more a carnalised Christ according to the Latin dogma than an anthropomorphic God, and still less a ‘Pastor’ in the person of a Pope, it is not the adepts who will ever go toward ‘the Mount of Salvation,’ (as invited by the Abbe). They will rather wait that the Mahomet of Rome should go to the trouble of taking the path which leads to Mount Meru.” . . . This is not rejecting “the authority of Christ” if the latter be regarded as we and Laurence Oliphant regarded Him, i.e. as an Avatar like Gautama Buddha and other great adepts who became the vehicles or Reincarnations of the “one” Divine influence. What most of us will never accept is the anthropomorphized “charmant docteur” of Renan, or the Christ of Torquemada and Calvin rolled into one. Jesus, the Adept we believe in, taught our Eastern doctrines, KARMA and REINCARNATION foremost of all. When the so-called Christians will have learnt to read the New Testament between the lines, their eyes will be opened and – they will see. 2 Devachan, rather; the entr’acte between two incarnations. 3 Vide Lady Grant Duff’s article “Laurence Oliphant” in the Contemporary Review for February: pages 185 and 188.